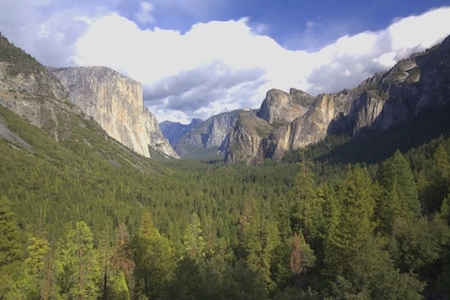 Yosemite Valley in the western Sierra Nevada Mountains. June 14, 2017 – What if nature were to become a polluter, discharging millions of tons of planet-warming carbon into the atmosphere in much the same way as diesel-fueled trucks or coal-fired power plants? This nature-as-polluter scenario might seem far-fetched, but it’s well on its way to becoming reality, according to a recent study co-authored by UC Merced Professor LeRoy Westerling. In a paper published recently in Scientific Reports — “Potential decline in carbon carrying capacity under projected climate-wildfire interactions in the Sierra Nevada” — Westerling and collaborators from the University of New Mexico and Penn State University used three climate models and data from the Intergovernmental Panel on Climate Change to examine how rising global temperatures and increasingly severe wildfires will affect Sierra Nevada forests. Their conclusion: Changing conditions will turn today’s Sierra Nevada forests into tomorrow’s greenhouse gas emitters. But projections from Westerling and colleagues suggest that this may change. According to their models, Sierra Nevada forests will experience both a dramatic loss of stored carbon and a substantial decline in their ability to remove CO2 from the atmosphere. Rising temperatures are creating a warmer, drier Sierra Nevada climate. Westerling previously showed that these changes are leading to dramatic increases in the frequency, size and duration of wildfires. The new study suggests that these same changes will make it harder for forests to regenerate, leading to a loss of forest density, with plants better suited to the new climate eventually replacing trees. But the carbon stored in forest trees has to go somewhere. As trees are burned in more frequent wildfires, and as dead trees undergo decomposition, Westerling and his colleagues predict that as much as 73 percent of the carbon in Sierra Nevada forests will be released, resulting in a dramatic spike in atmospheric carbon. This will transform the Sierra Nevada from a carbon sink into a carbon emitter, making the nature-as-polluter scenario a reality. Westerling and his collaborators note that their predictions are actually conservative. The effects might be more extreme than their models suggest. Though the predictions are alarming, the authors remain optimistic, hopeful that their findings can contribute to a larger conversation about environmental policy and promote avenues of research that lead to sustainable forest management.